Who created the Research Lifecycle? Who are the “Blue Button Experts”? What are some other Research Lifecycles and Data Models? Where are services or information for _____? 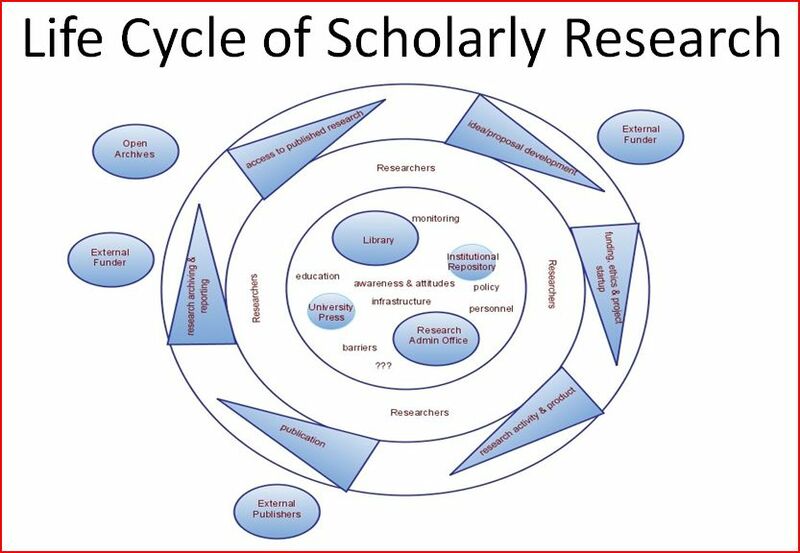 How do I cite the Research Lifecycle? How can I use the Research Lifecycle? What makes something become open access? How can I get more information about copyright? How can I share something I own online? The Research Lifecycle (RLC) Committee met on February 29, 2012 for initial discussions to identify stakeholder groups and needs for the RLC. The committee included Lee Dotson (chair), Penny Beile, Selma Jaskowski, Athena Hoeppner, Andy Todd, Sandra Varry, Mary Page, Rich Gause, Corinne Bishop, Therese Triumph, Bobby Ciullo, and Cindy Dancel. The group has grown and changed over time along with the versioning of the lifecycle. The design of the RLC was inspired by OpenWetWare’s Research Cycle. You may still hear this term at UCF. The term refers to certain librarians who help support various steps of the research process. The UCF Libraries is not alone in the creation of the Research Lifecycle. Many other examples exist for research in general or more specific to data. The following is a selective list of research lifecycles and research data models, several of which can be found in the CEOS’ Data Life Cycle Models and Concepts report. For additional information about research lifecycles and data models, access the report at the bottom of the list. For the most up-to-date information, please check the organizations’ websites or the authors’ newest publications and presentations. The CEOS (Committee on Earth Observation Satellites) prepares and updates Data Lifecycle Models and Concepts. The latest version is accessible on their Documents page. If you have trouble locating information or a specific service relating to scholarly communication, please see if it is easier to locate on the alphabetical list of research services. For additional assistance, please contact Sarah Norris, Scholarly Communication Librarian. Not sure if it is related to scholarly communication? Ask a librarian through chat, call, text, email, or in person. University of Central Florida Libraries Research Lifecycle Committee. The Research Lifecycle at UCF. 2012. Online Graphic. University of Central Florida Libraries. University of Central Florida. Web. (insert Day Month Year accessed). We have documents to help promote and explain the Research Lifecycle. Please feel free to use them. The content is made available under a Creative Commons BY-SA 3.0 license, meaning that any of the tools below can be downloaded, reproduced and/or modified as needed, but give appropriate credit, indicate if changes were made, and share with the same license. If you have any other questions, please do not hesitate to ask us. PDF [14.7 MB] with clickable bookmarks to related sections of the website. Great file to email or load on a USB drive. Four bookmarks to a page, double sided. Click thumbnail to view, save or print full size PDF [3.8 MB]. 11″x17″ handout without black background for quick printing. Need something a little different? Contact any member of the Scholarly Communication Advisory Group to request a new tool. The type of “information” usually associated with open access is an academic journal article. Books, images, textbooks, datasets, software, and many other types of information can also be open access. The way something is published determines if it can be made openly accessible. There are also academic journals that include both open access and subscription based journal articles. These are often called, “mixed” or “hybrid” journals, because they contain a mix of content. Readers can access the open access journals freely, while any articles published traditionally can only be accessed if the reader has subscription access to the journal. In both traditional and hybrid journals, if an author wants to publish and make their work openly accessible, they will often have to pay a fee, called an article processing charge (APC), to do so. This APC helps off-set publishing and editorial charges that the journal would traditionally get by charging a subscription fee to readers. Prices vary and will depend on the journal. In addition, some journals allows the authors themselves to put their articles online in institutional repositories, personal website, and online faculty profiles. This is often referred to as “self-archiving,” or “green open access.” Being able to self-archive your published work online will depend on publisher terms and restrictions. For instance, in some cases, a publisher may not allow the author to use certain versions of their article online; or, they may have to wait a specific amount of time before they can place their articles online beyond the publisher’s website. In short, plagiarism is using someone else’s work as if it is your own. Copyright infringement is using someone else’s copyrighted work without permission. These two issues can overlap. See our blog article for more information. If you have questions or need more information about copyright for your research, teaching, or course-work, you can contact Sarah Norris, Scholarly Communication Librarian, or schedule an appointment. You can also find additional resources for copyright on our research guide. If you own the copyright to a work, there are different ways you can share it online. One way that you can share your content and allow others to use your content with clear guidelines is to use a Creative Commons License. publishing in a book, journal, etc. If you have retained the copyright of your work, you can explore adding a Creative Commons License to the work. When adding a Creative Commons license, you are making it clear what others can do with your work. There are many different license types for you to choose from, and it is important to select the license that works best for you as the content creator. As a user of copyrighted works, you can also use Creative Commons to search for items people already have shared.